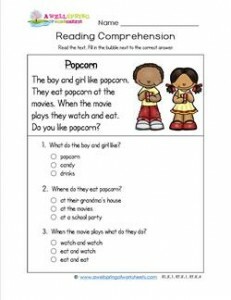 This reading passage for kindergarten has a brother and sister who are fans of popcorn … and the movies! Are you? Okay, the passage says they’re a boy and girl, but I know they’re brother and sister, because I created the worksheet (ha!, ha!) and because only a boy and girl who were brother and sister would dress in the same colors like they are! Choose from one of the three worksheets included in this set – the color worksheet, the black and white worksheet, and/or the answer sheet.